Good morning everyone. I got up early enough this morning to go for a run before my Pilates session at 1pm. I took a fairly light breakfast so that I wouldn't need to wait long for it to digest before heading out. I had a fruit shake, coffee, one muffin and a natural flavoured yoghurt with some added blueberries and bee pollen. Just before heading out of the door I ingested one Gu Roctane gel. The taste was okay - not that bad and not that great either. A few gulps of water to wash it down and I was out of the door with Negrita in tow. I had planned to run a half marathon, but guessing that it would take me 2 hours, which wouldn't give me that much time to rest afterwards before the Pilates lesson, I opted instead for a little shorter but faster run. I headed off down to the lake and decided I would run 7.5kg before turning round and heading back home, making 15km in total. I felt pretty fast today and decided to push it fairly hard. I covered around 12km in the first hour and the more I pushed the stronger I felt. The pack felt very comfortable and was not bouncing much at all. 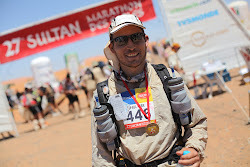 It will be interesting once the MDS has finished to dump the pack and see how much easier it is to run without one, because the pack doesn't really feel like a hindrance despite the fact that it obviously is one. By the time I got home I had covered 15km in 1 hour 16 minutes and 19 seconds. My average heart rate was 146bpm and my maximum heart rate was 173bpm. A quick weigh in after I got back revealed that my pack now weighs 8.5kg (with both water bottles emptied out). 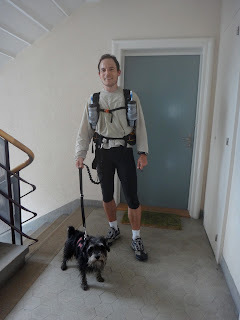 I am 74.9kg fully clothed (but without shoes) and 83.4kg with my pack and both water bottles emptied. During the run I was carrying 1kg of water so 9.5kg in total. Some months ago at Holmes Place I weighed myself in at 73kg unclothed, so either my clothes weigh 1.9kg or the scales I have at home are not that accurate (also possible) or I have put on a tiny bit of weight. The very latter would not surprise me as I have definitely gained some extra muscle mass in my legs as of late. Bearing in mind that my pack is only 8.5kg I may well decide to leave in all the existing freeze dried meals plus the Peronin and energy gels, meaning I have around 3,000 calories more than the minimum requirement of 14,000. Final decisions can be made later on that front though.